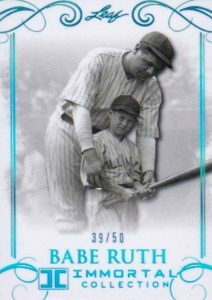 Despite delivering just six cards per box, 2017 Leaf Babe Ruth Immortal Collection Baseball uses multiple memorabilia choices associated with Ruth to stand apart. Each box contains two stadium seat relic cards and two game-used bat relic cards. A more premium version of 2016's Leaf Babe Ruth Collection product, the '17 edition cuts down on the base offerings while guaranteeing multiple hits per box. 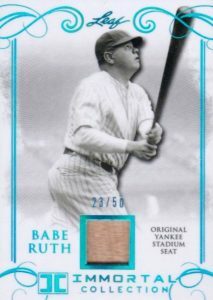 In addition to two quality base cards, the boxes feature a pair of Babe Ruth Original Yankee Stadium Seat Relics. 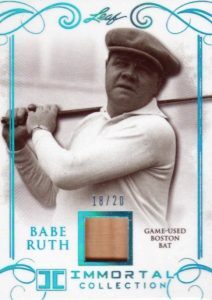 Taking that to another level, collectors can find two different Babe Ruth Game-Used Bat Cards, with one each from his time with the New York Yankees and the Boston Red Sox. The ultimate chase, 2017 Leaf Babe Ruth Immortal Collection Baseball also boasts a shot at one-of-one bonus hits. 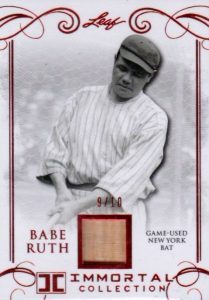 These include a Game-Used Bat Barrel and Bat Knob card for Ruth as well as a Babe Ruth Cut Signature card. 2017 Leaf Babe Ruth Immortal Collection Baseball is limited to 175 cases, or 1,750 boxes. 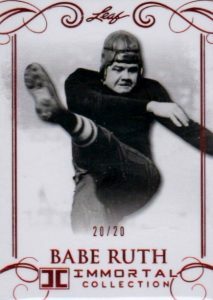 *All cards feature Babe Ruth. Blue Foil is the base version for each set. Serial numbered #/50. 2 per box. PARALLEL CARDS: Red Spectrum Foil #/20, Gold Spectrum Foil #/10, Purple Spectrum Foil 1/1. Serial numbered #/20. 1 Boston and 1 New York bat relic per box. PARALLEL CARDS: Red Spectrum Foil #/10, Gold Foil Spectrum #/5, Purple Spectrum 1/1. Having pulled the Babe Ruth 1/1 Bat Knob Card one week ago today, I”m certain my 5-Star rating could be considered to be somewhat inflated. However, with this pull-of-a-lifetime now tucked safely away in my safe, I’m confident no one could blame me for any faux pas. Thank you, Leaf, for a product which brings the collector the opportunity to own a piece of the Baby’s phenomenal career! 2016 Leaf Babe Ruth Collection Sealed Box 20 Packs Autograph? Bat Card?